Within the last few years the trend has been towards machine built wheels and pre-built “custom” wheels. Funny they all look the same to me. Gone are the days when you could pick out your own favorite hub, rim color, spoke pattern and build the wheel of YOUR dreams, something that would be just right for you; your ride style, weight, etc. It was great too, ‘cause the guy that built them for you was right there at the local shop if you had a problem. And it was usually easily fixable. No waiting days or weeks for someone to get your wheel back to you so you could ride. The guy that built it knew how important it was to you, and he had a vested interest in it. Oh…did I say it’s long gone that day? Take heart, you still have that option. With over 25 years of experience building wheels, Chaz will be happy to build a set of wheels that are designed specifically for you. 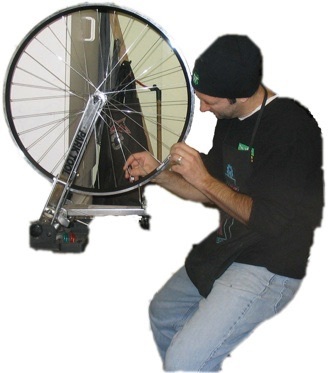 We can use your existing hubs, but Chaz will not build using old spokes or rims.